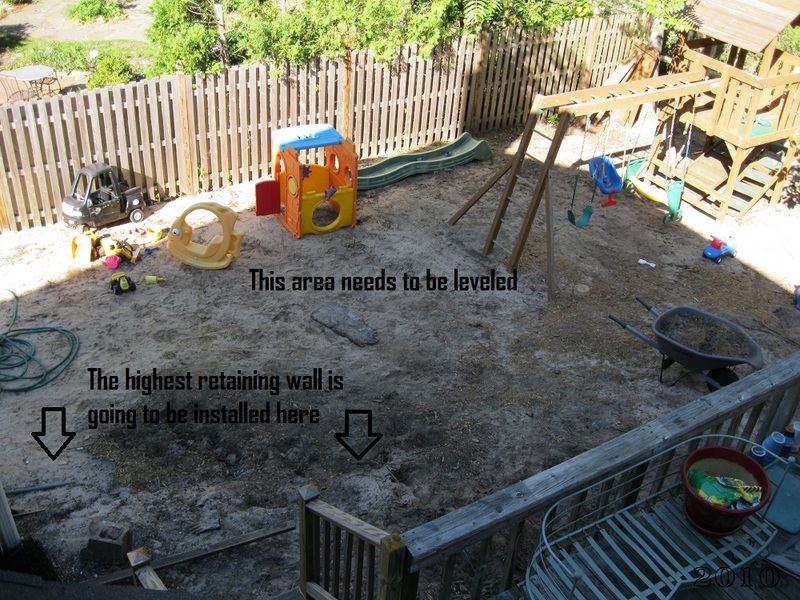 I started the permit application process in June 2010, right after I got busted for tearing up my yard with a Bobcat. In September, we STILL had not received our permits and I was getting antsy. A new topographic survey was drawn up (at a cost of $1200) and then these are my drawings on top. 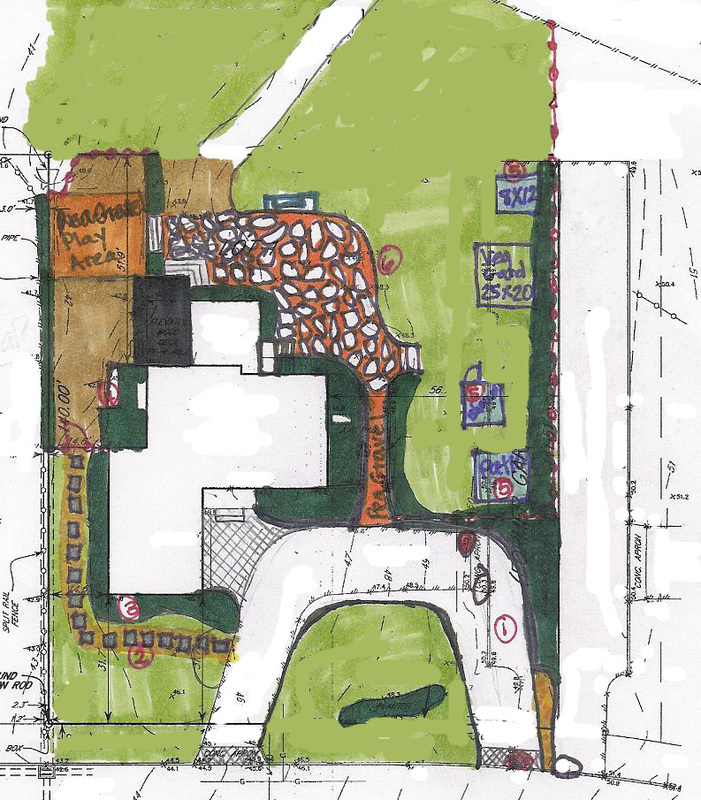 It was a weird process for the engineer because I am not a landscape architect and all I could do was try to draw pictures of what was in my head. The problem was I was the designer. The engineer had to go off my plans so I could submit the plans to the township. Had I not been required to do this for the permits, I don’t know that I would have taken such a hard look at the “big picture.” But you know what? The finished product is damn close to those sketches I drew back then. Of course I made changes and figured out details as I went along, but that “big idea” is sitting right outside my front door, right now. The only area I felt like I could touch without getting in trouble was the front planter. I had done enough work on this area before the permits were submitted, that the front planter bed was included as an “existing” condition. 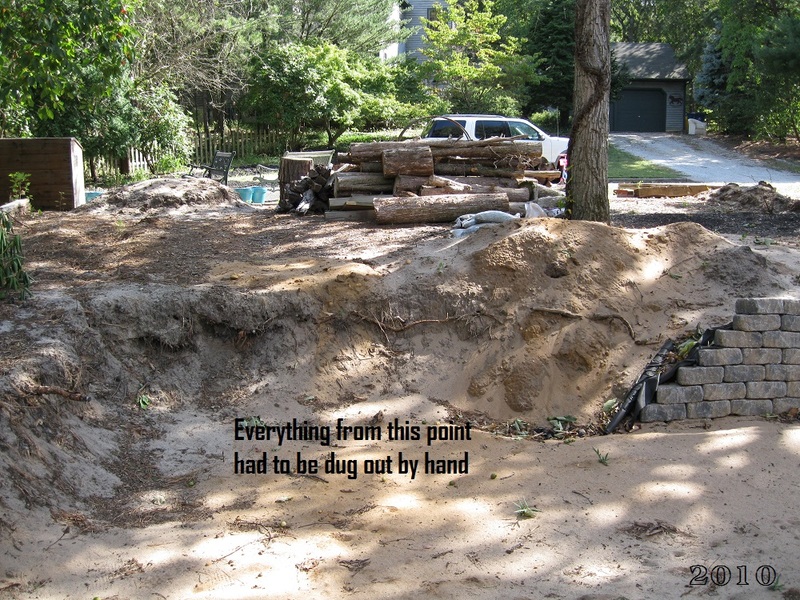 We dumped some of the dirt (really it was sand) that was dug up in the backyard in between two trees out by the curb. 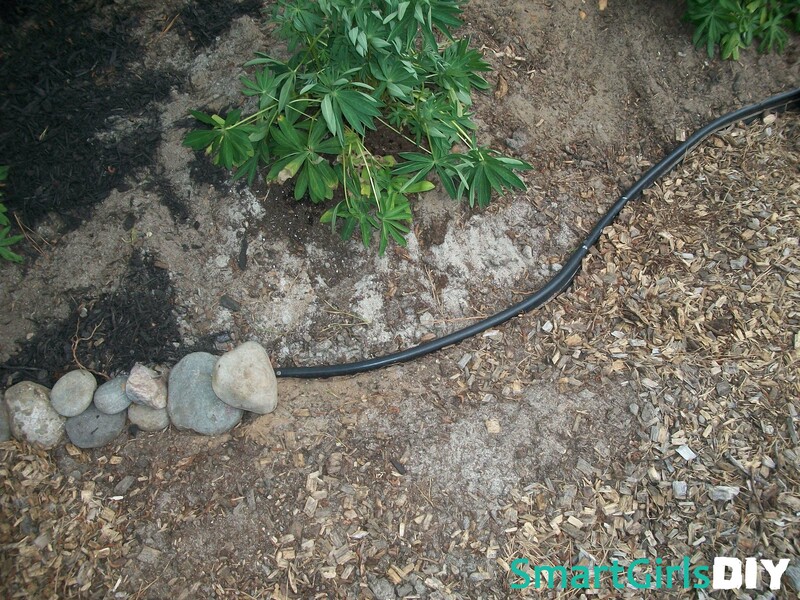 There were remnants of an old planter bed buried under heaps of wood chips, including this ugly black tubing. I added some more tubing and decided to cover all of it with rocks. This was the very first time I was able to plant anything in our yard! I also tore out the ugly shrubs up against the house. 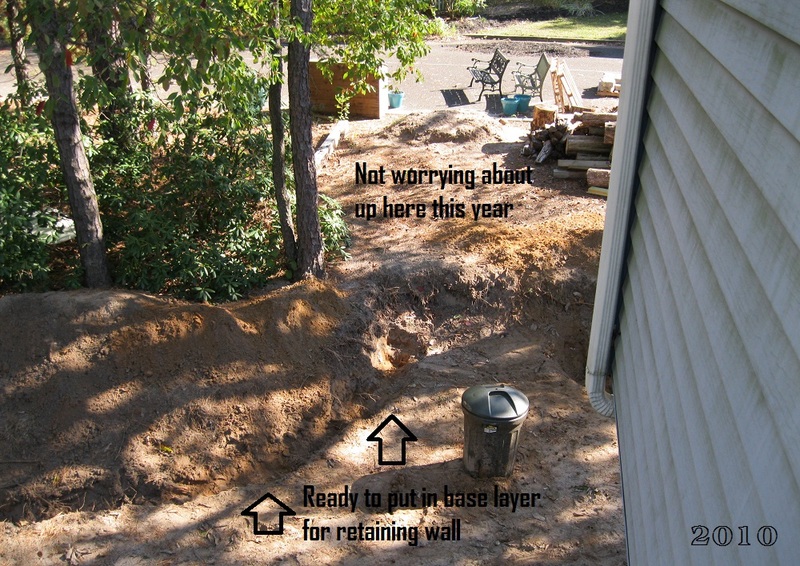 Oh wait, I was also allowed to work on was the retaining wall next to the house. 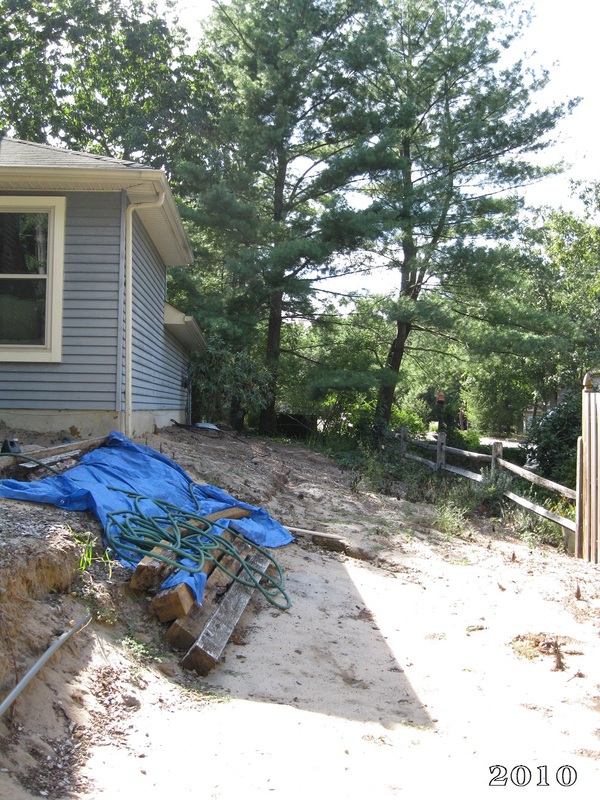 The zoning officer said because I was replacing an existing wall, I could go ahead and do that before the permits were in. 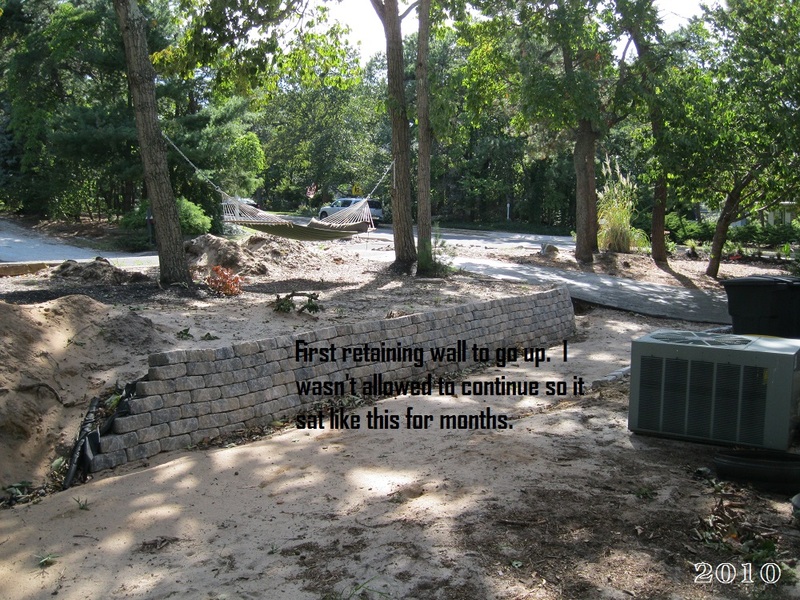 Recall the old retaining wall… This was what I built in its place. And by I built, I mean I built. Not my husband. Not a contractor. Me. With my two, slightly manly, hands. Just trying to clarify, people. We finally received our permits in October and we got to work right away. 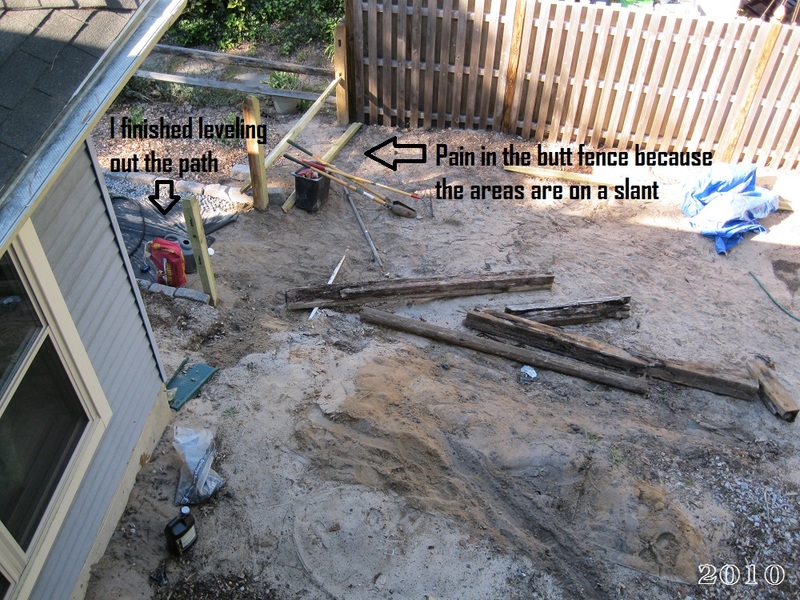 I was not sure about the stairs that would go in picture above, so I left a gap and continued the retaining wall around the yard. Ahmed Hassan told me I was not supposed to connect the downspout to the french drain pipe, but you know what, it works like a charm (read about my meeting Ahmed HERE). Water used to pool right around the house and now it’s carried out to the woods. The holes in the drain pipe also collect water that seeps in from the ground. 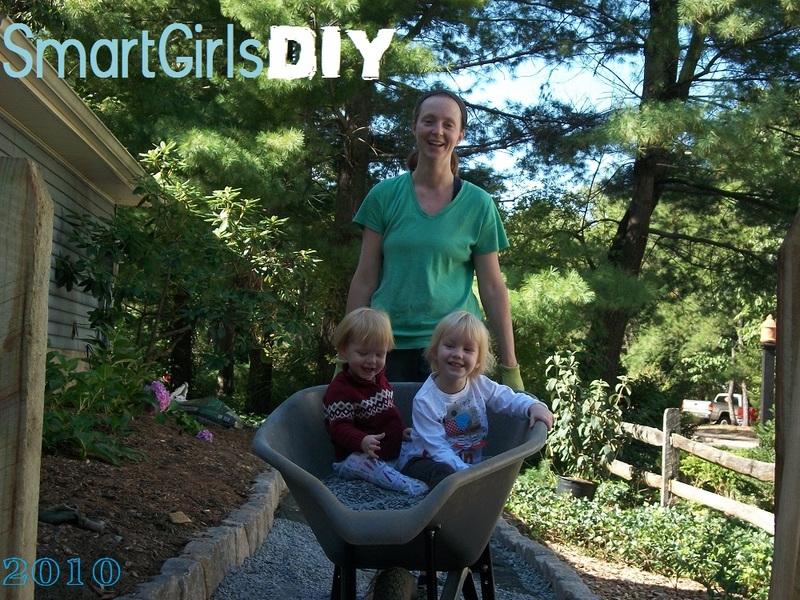 It’s been a win-win and I’m glad we took the time to install it before we laid out all the gravel. We actually had Lulu’s 3rd birthday party with the yard looking like this. 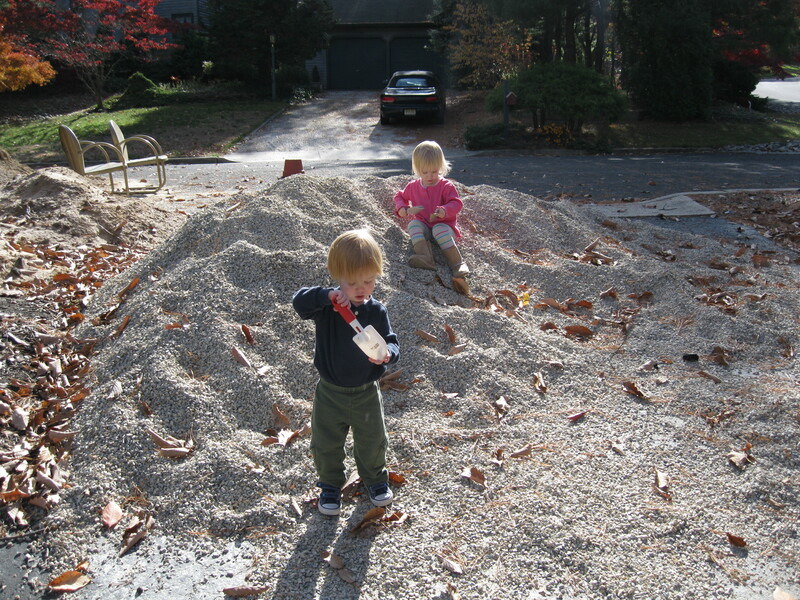 The kids didn’t care and the parents thought it was already a vast improvement over the original yard. I replaced that stupid staircase and landing and stained all the wood on the back porch a few years later. Boy, what a difference! Work was going on on the other side of the house as well. 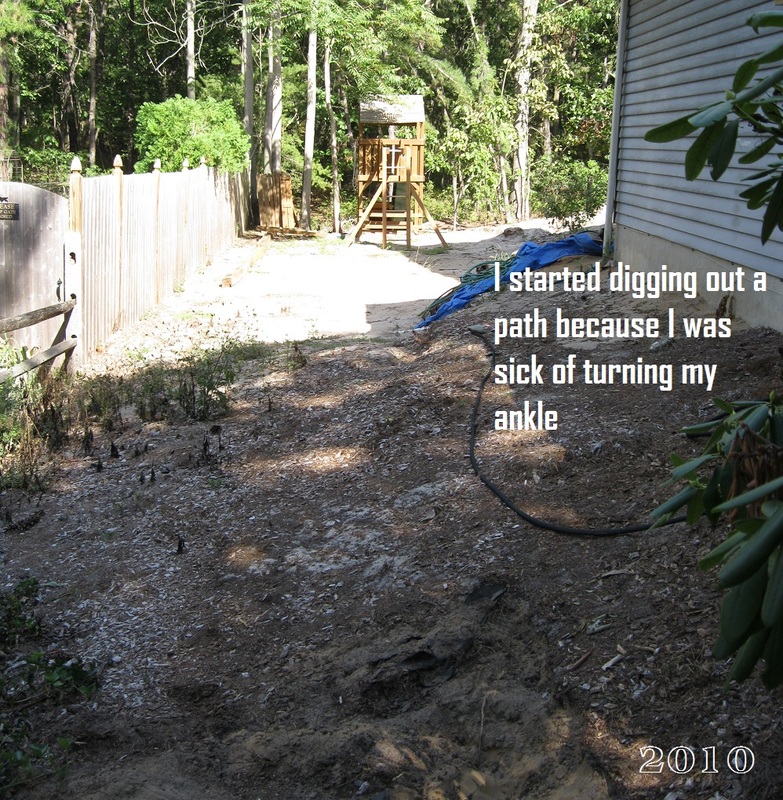 I had long hated the ankle-twisting slant behind the garage, so I dug a path, lined both sides with pavers, covered with landscape fabric and dumped a bunch of gravel on top. It was one of the easiest, most dramatic changes. To dig out this path, I simply took a little dirt from the left (top) and added it to the right (bottom). Eventually, it looked like this. Now to connect the nice path the the backyard. And I wanted desperately to build a fence and gate to keep my little munchkins contained to the backyard while I worked. 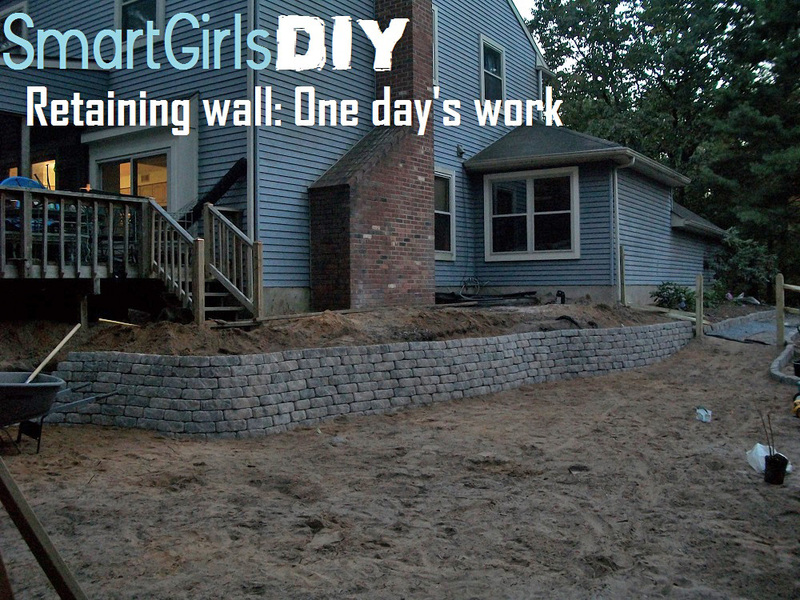 And in ONE DAY, I built this retaining wall. 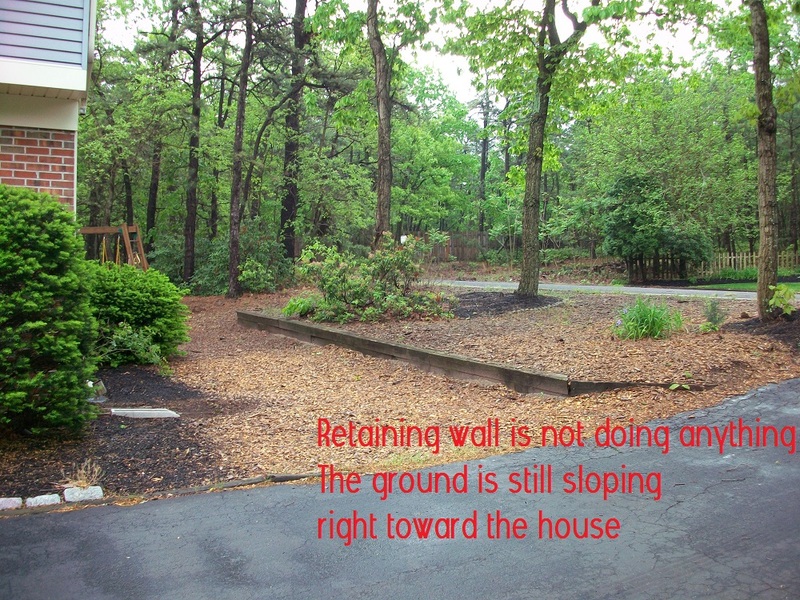 The complete retaining wall post will be up later today. Are you still reading? Yeah, I told you 2010 was a LONG year. And there was a lot more to come in 2011. Meanwhile, the kids thought it was a totally normal way to live! Hehe. 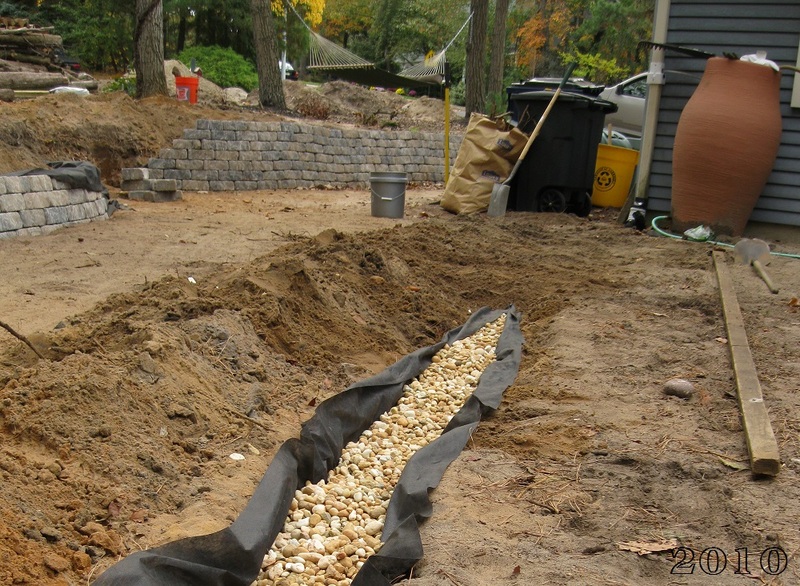 We got as far as laying down landscape fabric and filling in some gravel before we got shut down again. Our neighbor filed an appeal against our zoning permits and it was recommended we not do any more work in case the permits were overturned. Actually, I finished up some work on other side of the yard, that I knew wouldn’t be challenged. I put a 2 rail split-rail fence behind the kid area. I had to build an unseen retaining wall behind the fence so I could build up the area around a drain pipe to make it safe for the kids. I re-used the wood from the dismantled retaining wall to build it. So ends the first year of real work! For the complete yard history click here. Good lord, woman! You are super woman! Many kudos to you for doing that entire wall by yourself! I have been pulling weeds (I really need to rent a tiller) and I am exhausted. I can not imagine how tired you must have been after installing that wall! Any word on the appeal? Why is your neighbor filing it in the first place? – If you do not mind me asking? 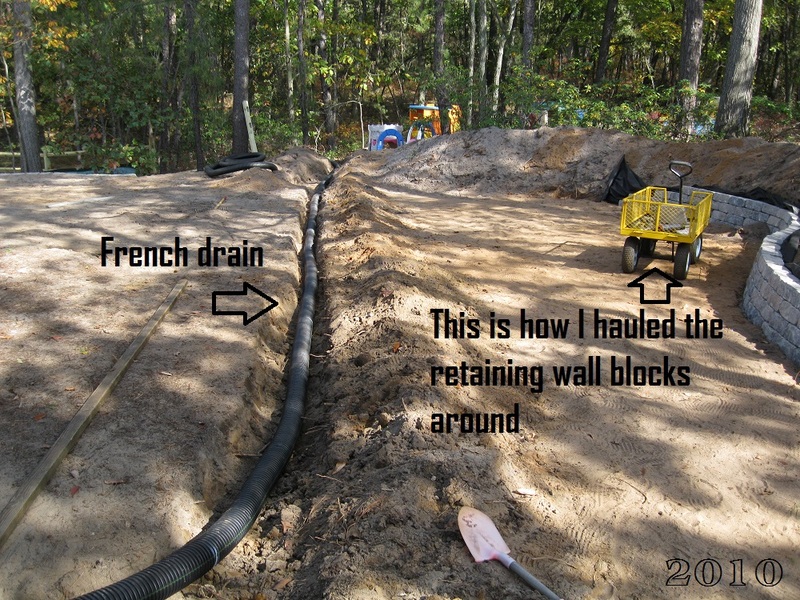 Ok so we need to install a french drain and you have inspired me to do so!! Your property is gorgeous and you are awesome!!! 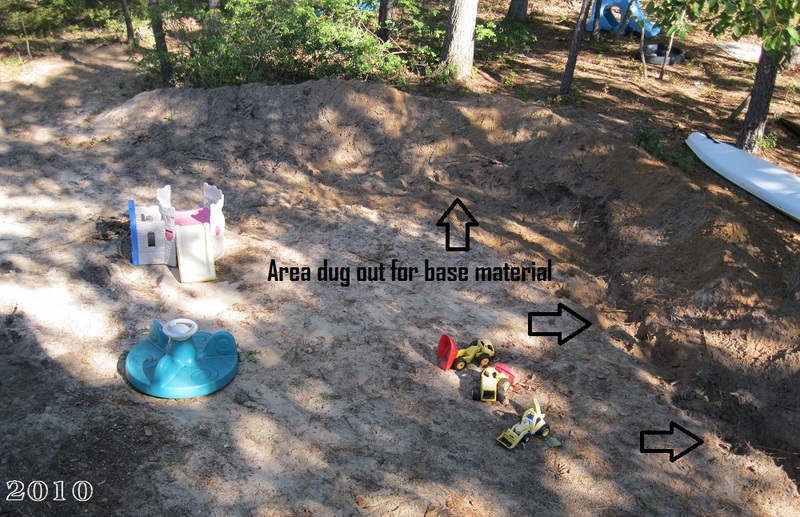 You should be so proud of yourself…I can relate…I dug all of my beds by hand! 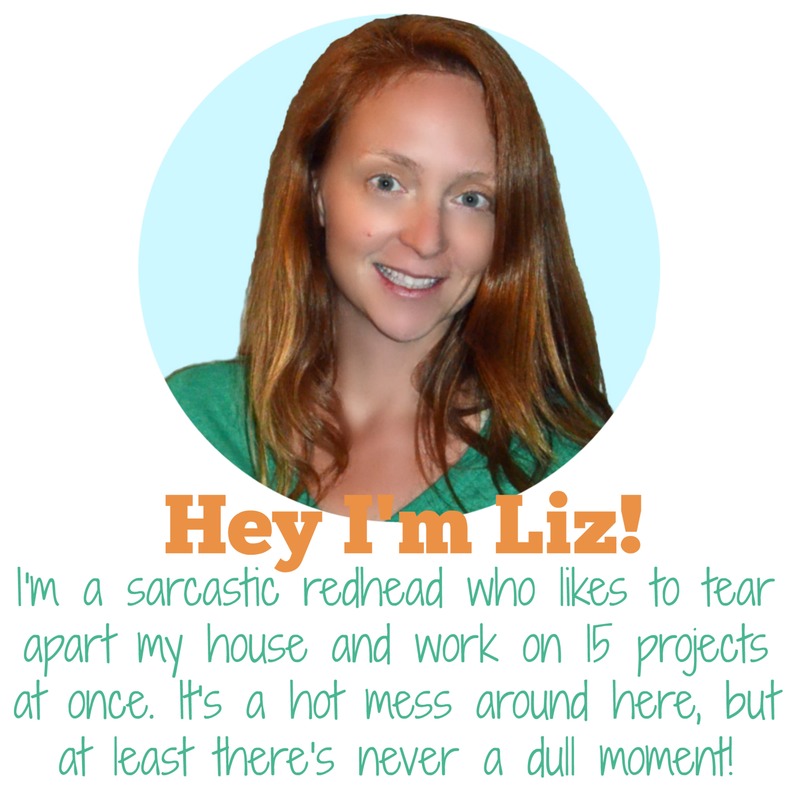 Just me…not the hubs! And what you created with that wall rocks!!! Your kids are adorable!!!! Mine are 13 months apart and we are getting the twin thing a lot now too! Keep up the amazing work!!! Love it!! You and Julie are the best!! It is awesome to have both of you. I keep telling you… we were separated at birth, you and me!! I’m sure my kids will get that question more as they get older, because it’s my son who’s older and he’ll certainly be catching up to his sister in height. Wait until you see what I did in 2011!! Holy cow! 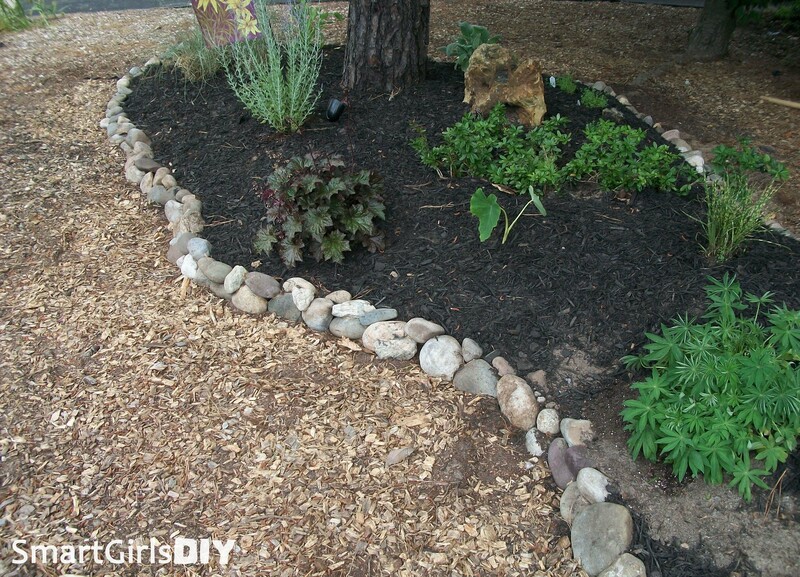 I started working on that post last night and I was so tired just from listing all the things I did in the yard! 🙂 To see it all written out makes it look crazy! But it’s really just what I like to do with my time. The fence/gates were the best thing I could do bc the kids can play and I don’t worry about them running into the front yard. I can’t wait to share with you guys! !